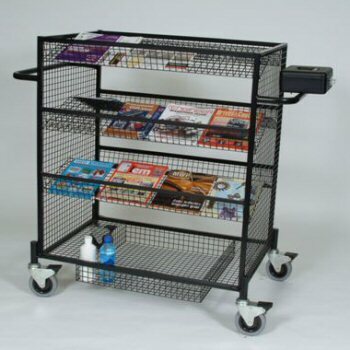 The trolley has four wire shelves and a cash box. The bottom shelf has a recessed section in the middle for standing bottles, the remaining three shelves are angled to display magazines and newspapers so patients can see them. With push pandles on the front and rear, the trolley is easy to manoeuvre on four braking castors.